My kids love the reality TV show, Extreme Makeover: Home Edition. The basic plot of each episode is the same. The team reviews application tapes from a number of families (they only show the winning application on TV), and the application is a video clip explaining that someone (usually the parents of the household, or one of them, since sometimes the other has passed away tragically) is a really good person who gives a lot to other people and that he or she has undergone difficulties, and they don’t have a very nice place to live and wouldn’t it be wonderful to do something for them – you get the idea. Next, the team goes to visit this person and announces that they’re getting a home makeover. They send that person and their family away for a week to Disneyland or some other fun place, and then they spend hundreds of thousands of dollars, some of which is donated, some of which comes in the form of donated materials from businesses, and they make the old house into a huge luxurious mansion of a home complete with every mod-con, a home fit for a Hollywood celebrity. There will usually be computers, televisions, amazing kitchens and lounge suites, beds fit for kings, often a flash brand new car – you get the idea. Then the family comes home, the crew have the bus moved away from in front of this spectacular new residence, the family goes wild and then we get the guided tour of the house, watching the kids scream and squeal about how wonderful their new bedroom is, they hug the team and thank them, telling them how wonderful it all is, the parents tearfully thank them for the wonderful work they done for them, and eventually the heroes drive off into the sunset. I hate to be the Grinch. I really do. And don’t get me wrong – people are free to be as generous as they like to anyone they like. It’s a free world! Well, some parts of it are. I also don’t want people thinking that I’m against everything these guys do. I’m not. But there’s something wrong with this picture. There’s just no need for it. Even if we’re committed to giving to the poor, even to the point of giving away a new house (!!! ), there’s still no need for the super duper huge, pimped out mansions replete with console games and laser defence systems (OK, not quite) that I see on that show. What would be wrong with renovating their house for them so that it’s nice and meets all their needs? If they need transport, how about a modestly priced minivan? Why the need to, effectively, get them living like the rich and famous? My family and I have been close with Nathan for years, and while I’m sure they are eternally grateful for this opportunity, it is in no way “fulfilling their dreams.” These are the kind of truly selfless people who would rather these millions of dollars be spent on the less fortunate -because yes, there are plenty of less fortunate people than the Montgomery’s, here in our community- than on an extravagant mansion for their relatively small family. ABC would be better off sticking to actual renovations (I don’t interpret “makeover” as “demolish”), and giving all of that saved money to Salt and Light. Well said. Yes, it’s an emotional rush to see people’s lives turned upside down in this way, especially when accompanied by (very genuine) sob stories and soft music. But I really think it distorts the meaning of charity and uses smoke and mirrors, overshadowing the ongoing hard work of charities on a daily basis worldwide. 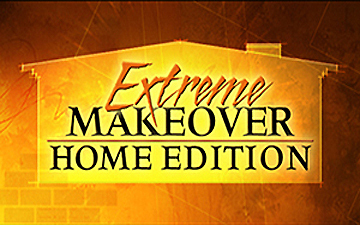 I’d love, for example, to see Extreme Makeover: Home Edition use that resource pulling power and to put it behind, say, Habitat for Humanity. Agreed. What’s even worse is that usually the kids in the family get bedrooms that are completely decked out in ways that appeal to their interests and hobbies – but when the kid matures a few years, are they really going to still want a room with a race car bed, or Disney wall-paper, or cartoon decorations, etc.? The other problem is that home upkeep is not free. At the end of the day, unless the family dramatically increases its income, it will not be able to afford to keep the home with all its technology and ultra nice furnishings maintained and running. Financially, they will often be better off selling the house and using the profit to finance a more reasonable and maintainable home.